Thermodenuder (TD) was a useful tool in atmospheric research by removing semi-volatile aerosol. 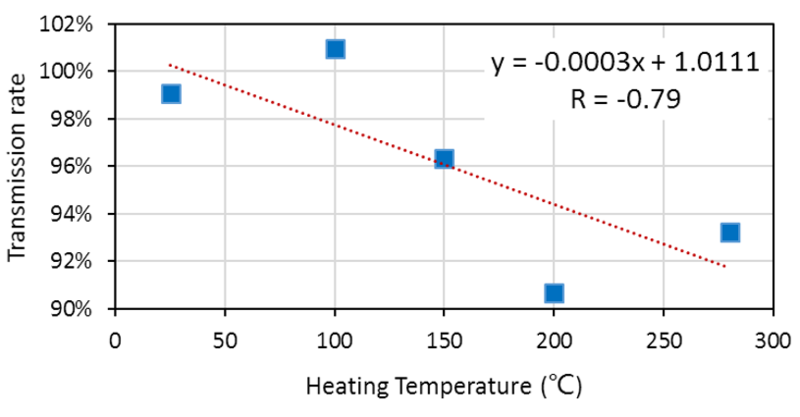 Temperature profile is important to assess its performance, as shown in Figure 2. Our TD is comparable to Wehner TD, though the inlet temperature of our TD is a little lower. 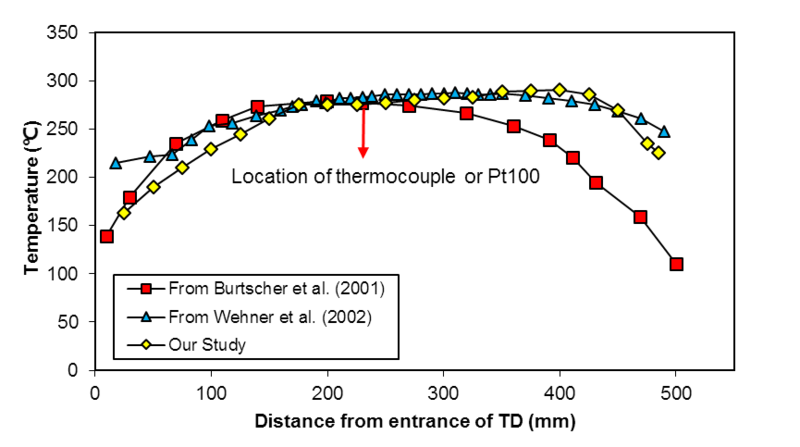 Both Wehner TD and our TD have high exit temperature, which would avoid recondensation before evaporated gases were adsorbed by activated charcoal. Besides, TD losses are inevitable due to sedimentation, diffusion and thermophoresis inside the heating tube. In this work, we use elemental carbon (EC) which is refractory at high temperature to quantify the temperature-dependent TD loss at different temperature (i.e., 25°C, 100°C, 150°C, 200°C, 280°C), by collecting filter samples through TD and non-TD lines with two cascade PM2.5 impactors. EC was then measured with an OCEC analyser (Sunset Laboratory Inc.), following the NIOSH 5040 protocol. A transmission efficiency equation as a function of temperature ηt = 1.0111 – 0.0003*T (R = - 0.79, p<0.01) was then determined (see Figure 3), in which ηt is transmission efficiency and T is the set temperature in Celsius (°C).